Blossom Sauce Dish Set, 4-3/4"
Home | Gift Sets | Blossom Sauce Dish Set, 4-3/4"
This set of ceramic, cheerful and pretty blossom pattern condiment sauce dishes are 4-3/4 inches in diameter and 1 inch tall. They come in a green box that is perfect for gift giving. 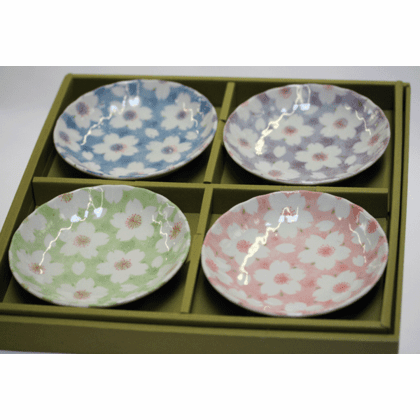 Set consists of four different colors: blue, pink, purple and green.